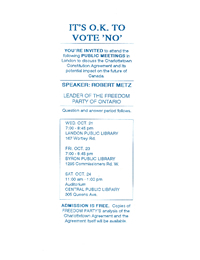 One-sided Freedom Party of Ontario flyer promoting then Freedom Party leader Robert Metz’ October 21, 22, and 23, 1992 public meetings to discuss the Charlottetown Constitution Agreement and its potential impact on the future of Canada. 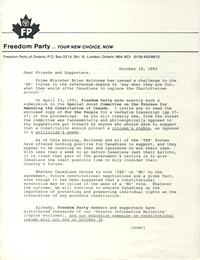 Two-sided Freedom Party of Ontario flyer. 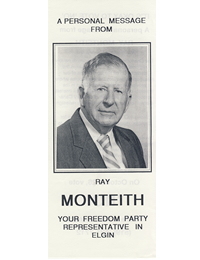 A personal message from Ray Monteith – Freedom Party’s then Elgin candidate – concerning the October 26, 1992 referendum on the Charlottetown Accord. Two-sided Freedom Party of Ontario flyer. 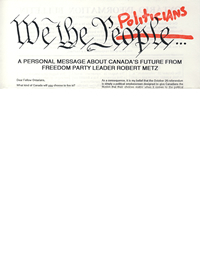 One side: “We the Politicians”, being a short essay or letter written and signed by Robert Metz. 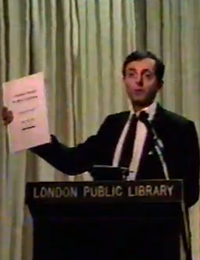 Opposite side: an Ontario Information Bulletin setting out Freedom Party of Ontario’s “conclusion highlights” drawn from Freedom Party’s assessment of the August 28, 1992 “agreement” in respect of the proposed “Charlottetown Accord” proposal for amending Canada’s constitution. Enclosed in the flyer: a postage-paid reply card. 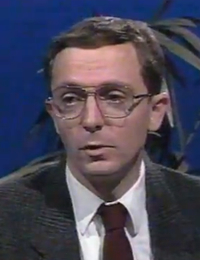 Robert Metz on London Community TV – Charlottetown Accord Referendum 1992: Why Vote No?